Whenever anyone I’ve met decides to go on this healthy lifestyle diet, they (including me) have at least one or two favorite foods (or ingredients) they trip up over and go into shear agony knowing their cravings will no longer be satisfied. For me, it was Tillamook cheddar cheese and mayonnaise. I would eat them separately or together, it didn’t matter. I always kept a healthy supply in my frig for whenever I got the urge to indulge. Mayonnaise, I could eat by the spoonful. I have never been shy about generously slopping it onto sandwiches and burgers, or mixing into salads and dips. (Oh, and deviled eggs! Yum.) 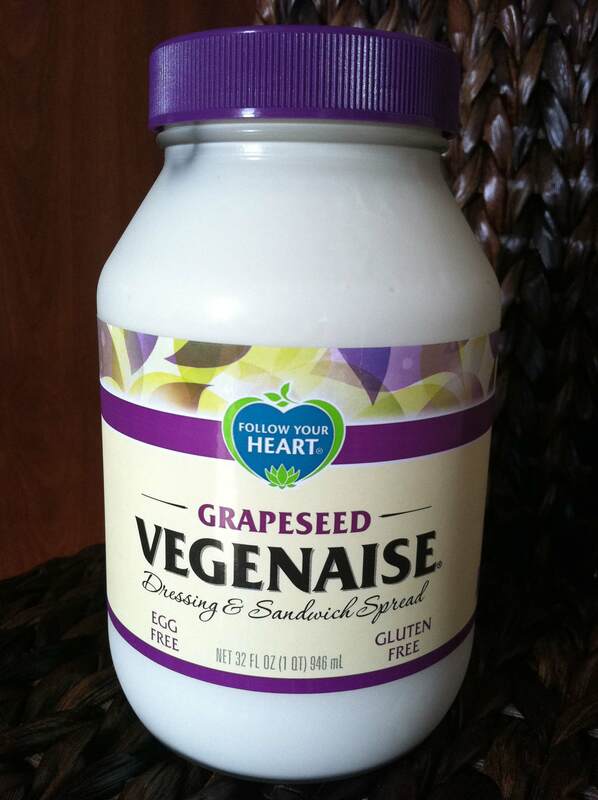 So when I was told about this mayo alternative—Vegenaise—all I could do was sigh. An alternative?! Give me a break. Nothing can replace the goodness of real, artery-clogging mayonnaise. But out of desperation and commitment to giving this diet every chance for success, Grapeseed Vegenaise was one of the first items to go in my shopping cart at Whole Foods. I was anxious to rush home and give it a try, which is exactly what I did. And I haven’t looked back. I was so pleasantly surprised to find that it is so similar in texture, color, and flavor, I believed that Steve wouldn’t even notice it wasn’t mayo on his dinner salad that night. And he didn’t. Vegenaise is egg, dairy, and gluten free. It’s also corn, yeast and starch free. It is low in sodium, very low in saturated fat, has no cholesterol, and no hydrogenated or transfats. The kind I enjoy (there are 4 other kinds) is made with grapeseed oil which is known to raise HDL (good cholesterol), and in turn, lower LDL (bad cholesterol). Grapeseed oil is also an excellent source of natural vitamin E and essential fatty acids. Here is one of my favorite salads made with Vegenaise. I hope you enjoy it as much as I do. Mix the cumin and salt & pepper into the vegenaise and mix into the meat mixture. Spoon over a bed of fresh baby spinach and arugula.